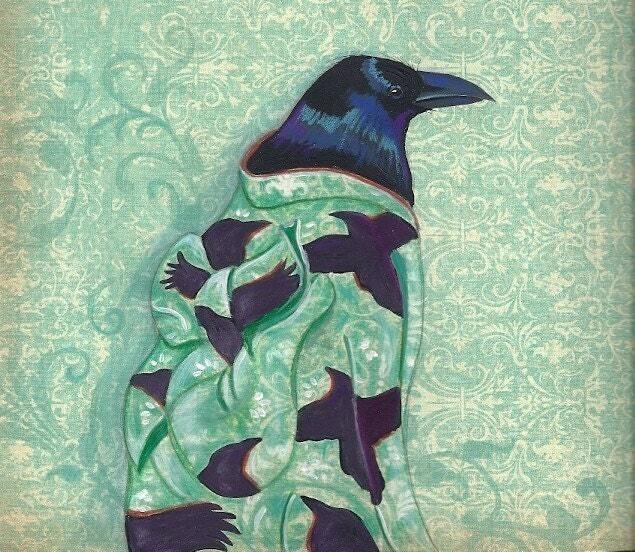 "When Raven wrapped herself in her ancestral kimono her heart became still and peaceful. She felt surrounded by her loved ones, past and present. Some days that was all she needed." This is from an original painting I did for Illustration Friday's word:wrapped. I love painting on patterned paper. Each notecard will have the quote on the back. The cards meaure approx. 4x5 and come with a white envelope in a cello sleeve. It is blank so you can leave your own personal message. Love it. Beautiful colors, soft but distinct.I have framed it and hung it with another of her cards. Sent VERY quickly, well packaged, I will be back. Awesome card. Great quality and arrived in a timely manner. Lovely. Thanks again for a fine transaction. I need a whole set of these! !